In this article we take a look at some of the astounding discoveries of the last two centuries and show how physical evidence confirms aspects of the biblical record. Archaeology and Genesis - What Does the Record Show? Although doubters will always scoff at the truth of God's Word, fewer and fewer now doubt the Bible's historical basis. Archaeologists have made many significant discoveries that make the book of Exodus and the Israelistes' time in Egypt come alive. The Bible records the story of ancient Israel's conquest of Canaan under the leadership of Joshua. Did it really happen as the Scriptures record? 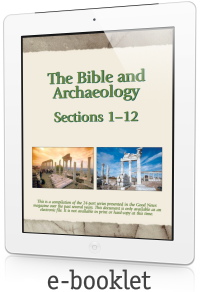 We continue our look at archaeological finds that shed light on the Bible. In earlier issues, The Good News examined archaeological finds that illuminate portions of the book of Genesis and Exodus. 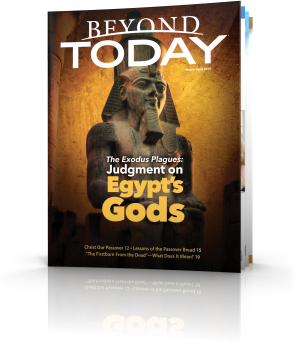 In this issue we continue our exploration of discoveries that confirm other aspects of the Exodus account, beginning with the incident of the Israelites' worship of the golden calf. In 1956 another remarkable discovery was made that provides additional evidence of the authenticity of the biblical accounts of David's days. What has archaeology revealed about King Solomon's reign in the 10th century B.C.? Remarkably, there is much evidence to corroborate the biblical account. This series in The Good News will continue covering archaeological discoveries relating to the later kings of the house of Israel. It is astonishing how much evidence supporting the biblical record has been uncovered by the spade of diligent archaeologists. The previous issue presented archaeological evidence that confirms and clarifies the biblical record of the early kings of the northern 10 tribes of Israel after the death of Solomon. We continue the story with the later kings and downfall of the kingdom. In the last two editions of The Good News, we covered the history of the kings of Israel after the northern 10 tribes broke ties with the kingdom of Judah, comprised of two tribes in the south. We now turn to see what archaeology has revealed about the kings of Judah during this time. 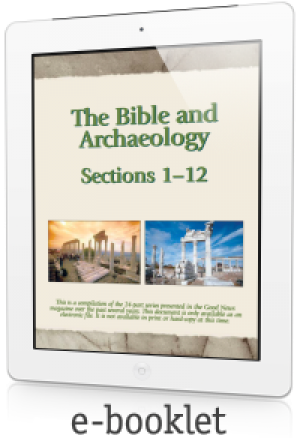 In spite of the relatively small amount of material that has been excavated and analysed, considerable evidence confirming the biblical account is available. An archaeological find from the 19th century clearly establishes Israel as a nation inhabiting Palestine in the 13th century BC. In Our Modern World, Can We Trust the Bible? Can we believe the Bible? With so many criticizing it for so long, is it trustworthy? What does the evidence from history, science and archaeology reveal? It’s about time you heard the truth about what the evidence really teaches us—and it’s far different from what the critics say! I Look forward to these studies.